“60 Years of Logos” is a celebration of Tom Geismar and the late Ivan Chermayeff, the dynamic duo behind Chermayeff & Geismar & Haviv — the company responsible for some of the most iconic logos of the modern age. Paola Antonelli, MoMA’s senior curator of architecture and design, talks to Stephen Colbert about the evolving definition and scope of design. I heart this woman. 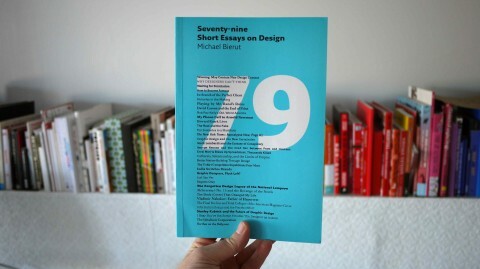 Lucky me, I just got my hands on the latest issues of Seventy-nine Short Essays on Design by Michael Bierut. Michael is not only an incredibly talented designer but also able to so eloquently and humorously talk about his work. A quote I keep coming back to. Taken from an A List Apart post written by my studiomate and friend Cameron Kozcon: An Important Time for Design. Freedom on the Fence is a 40 minute documentary about the history of Polish posters and their significance to the social, political and cultural life of Poland. The film examines the period from WWII through the fall of Communism, and captures the paradox of how this unique art form flourished within a Communist regime. The documentary contains interviews with older and younger generations of poster artists, examples of past and current poster work, historic and current film footage of where and how the poster is viewed, and commentaries from both American and Polish scholars and artists on the significance of the Polish poster as a cultural icon. Freedom on the Fence has been screened at several film festivals and was shown at the Museum of Modern Art in New York City, as part of an exhibit of Polish posters. If you’re interested in seeing the movie, you might want to know that Andrea Marks, the producer, is happy to present the film with a lecture at your venue. 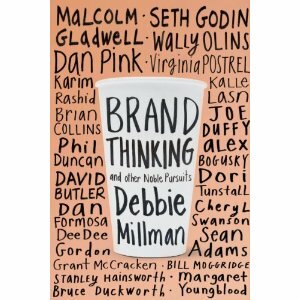 The lovely Debbie Millman published a new book called Brand Thinking and Other Noble Pursuits. Brand Thinking is a dialogue with 22 of the world’s top culture critics, design executives, and branding strategists – people like Malcolm Gladwell, Seth Godin, Daniel Pink, Grant McCracken, and Wally Olins – on the state of branding today, what “brand” truly means, and how companies and consumers can best embrace the future. In each interview, Millman cuts through all the empty jargon and buzzwords to expose the underpinnings of how people respond to the ideas of designers, and how the best brands open avenues for cultural change in our daily lives–whether we’re aware of it or not. FastCompany wrote a long post about the new book. Read it here. I recommend you watch the below video if you’re interested in the issue of scale in the world of design. Taped at a recent Smart Design Salon. I just stumbled upon an amazing collection of Book and Design related Flickr Sets by German based Design Professor Michael Stoll. 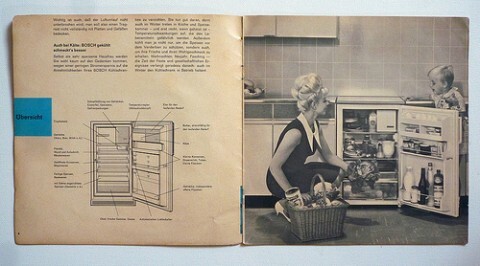 This Bosch Fridge Manual Set from 1963 made me chuckle. Or check out this Flight Thru Instruments book from 1945, describing different (military) techniques of flight in a profusely illustrated manner. 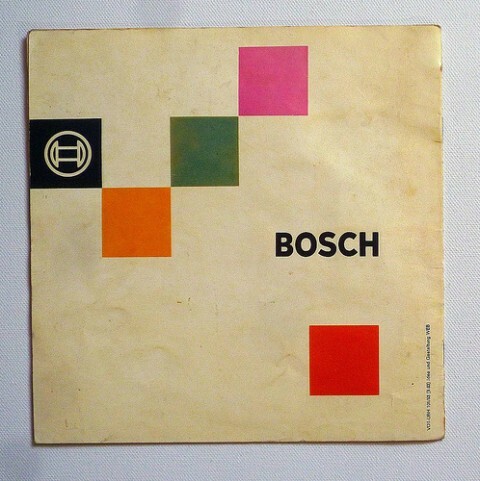 Or this Corporate Identity Brochure from 1972 about the City of Munich. 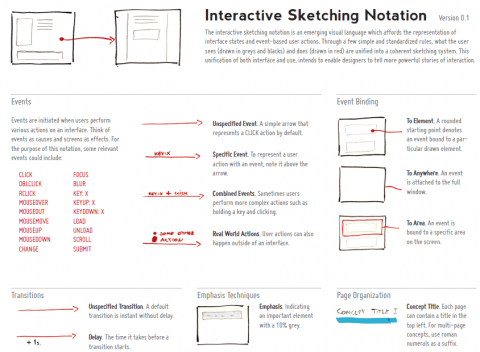 Do you design iPad apps? Then you’ll love DesignCommission’s iPad Dry Erase Board. To help you make the shift from design student to design professional easier Doug Bartow, principal of id29, and his colleagues put together this article listing 29 things they think all new designers need to know. 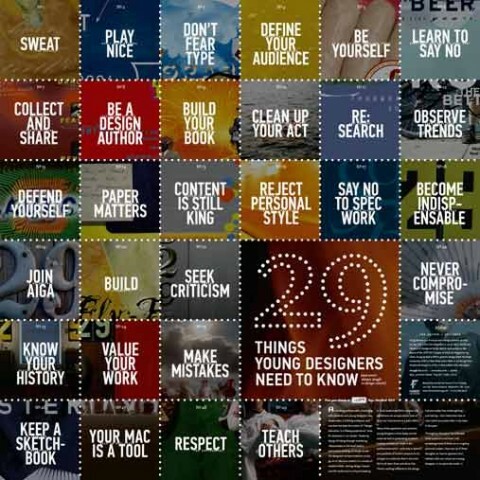 Read the 29 things all designers need to know. 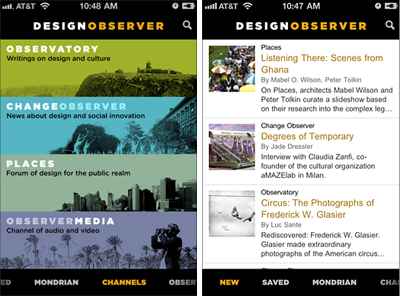 Design Observer just launched its iPhone App over on the App Store. The app lets users download a wealth of the world’s best design commentary on the go. It’s available for Free, download it here. 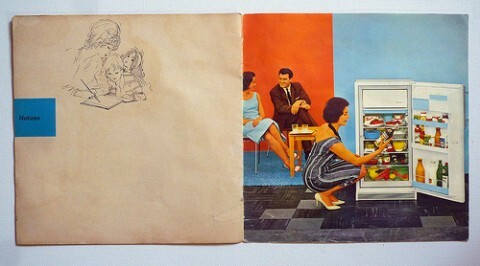 More about it over on Design Observer. Wally Olins’s lecture “The Nation And The Brand And The Nation As A Brand” from 2007. I agree with Rob, it’s well worth watching all four parts. How did I never come across the Ten Things I have learned by Milton Glaser? Did I study Graphic Design under a rock? I must have. What is good design is one of these questions I am being asked constantly. The sheer complexity of the answer usually makes me break out in a nervous sweat. And so far, nobody nailed the answer better than Dieter Rams in his Ten Principles for Good Design. What is your reference that you keep coming back to? Hat tip to by Jakub Linowski for creating and *sharing*! 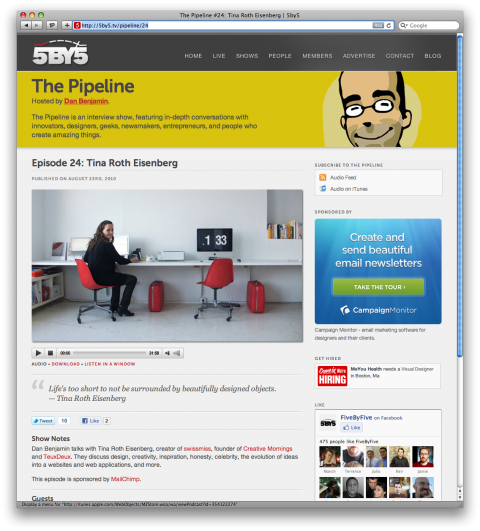 Dan Benjamin, mastermind behind the fantastic interview show called The Pipeline, was so kind to ask me to be on his show. You can listen to our conversation on his site, here’s the direct link to the MP3, or if you prefer, in iTunes. Dan, thank you so much for having me! 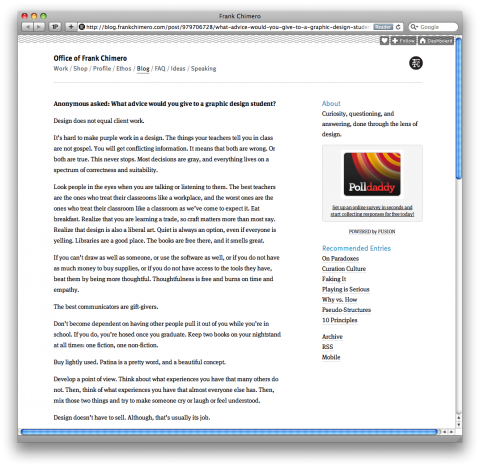 In this post Frank Chimero shares every little piece of advice he can think of he would give current Graphic Design Students. Keep two books on your nightstand at all times: one fiction, one non-fiction. Adobe software never stops being frustrating. If you see a ladder in a piece of design or illustration, it means the deadline was short. 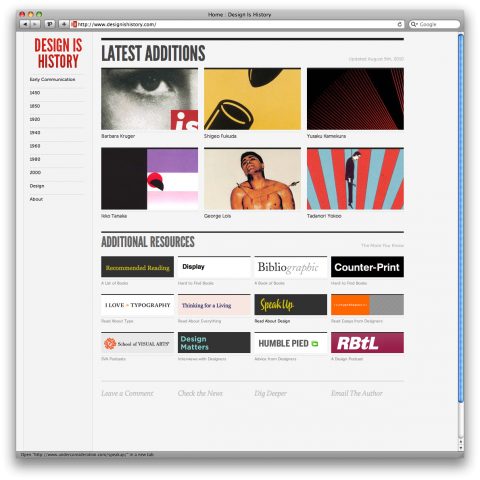 Design is History, a great overview on centuries of design. Part of the graduate thesis of designer Dominic Flask, Design is History was created as a teaching tool for young designers just beginning to explore graphic design and as a reference tool for all designers. It is supposed to provide brief overviews of a wide range of topics rather than an in-depth study of only a few. 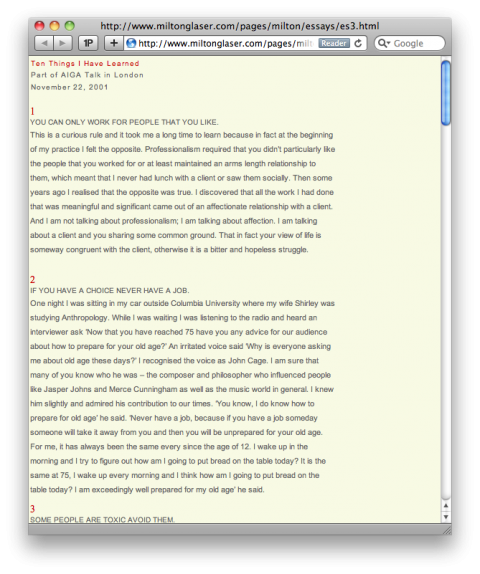 It is a constantly evolving, changing, expanding reference library.